i was recently approached by fragata to develop a couple of recipes using their products as part of a competition to win the opportunity to spend the afternoon in the kitchen with spanish chef josé pizarro. this was incredibly appealing for a number of reasons – i’m a huge fan of spanish food and have coincidentally most recently been enjoying that which is served by josé pizarro himself, at his tapas and sherry bar josé. it was also interesting to think about which fragata products to use – i already get through large amounts of their capers but was also interested to try the range of olives and peppers they have. so, this is my first recipe… as is so often the case, it was the result of looking at what needed using up rather than having an idea and going shopping for specific ingredients. in this case it was leftover lamb mince and some figs which caught my eye. i decided on lamb flatbreads. i wanted a flavour-packed topping so decided to slow-cook some red onions until they began to caramelise at which point i added some garlic, chopped capers and chopped green olives plus a little smoked paprika. this was mixed with my browned lamb and finished with a squeeze of lemon juice and some fresh parsley to brighten everything up. it was a delicious topping for flatbreads which were then cooked on a pizza stone and finished, once they came out of the oven, with a drizzle of yoghurt and some rocket. i hope josé likes them! if you fancy winning a cooking session with him for yourself, have a look here. to make the flatbreads, mix the flour and salt together in a large bowl. in a jug, mix the yeast, water and sugar, stir to dissolve and set aside for 10 minutes until the mix starts to foam a little. stir in the olive oil and then add the liquid to your flour. mix together in the bowl until most of the flour is integrated. if the mix is too dry add a little extra water or vice versa if it is very sticky. tip the mix out onto a floured surface and knead for 10 minutes until you have a soft, smooth elastic dough – it should still be slightly tacky to the touch. set aside, on a floured surface and covered with a clean tea towel, for 45 minutes. heat a teaspoon of olive oil in a pan and fry the mince until it starts to brown. add the smoked paprika and cook for another 5-10 minutes over a medium heat until the meat begins to catch – you want the edges to begin to go crispy. remove the mince from the pan, leaving any fat behind. add the onions to the pan, with a little extra olive oil if it is needed (i didn’t need any) and cook over a medium heat until they have softened and started to become translucent. add the garlic, capers and olives and cook for another few minutes then lower the heat and continue to cook, gently, until the onions have caramelised – they will be very soft, slightly caramel in colour and have a sweet flavour. return the mince to the pan and cook together for a couple of minutes. add the lemon juice and parsley, taste for seasoning and then remove from the heat. to assemble, place a pizza stone (or a baking sheet) in the oven and turn it to it’s highest temperature. cut the dough into four and roll out each piece in turn – my pizza stone could hold two rolled out pieces so i made this in two batches. place the dough on the heated pizza stone, top with lamb and return to the oven. cook for 8-12 minutes, until the dough is cooked. 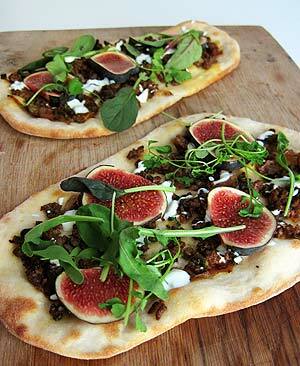 remove from the oven and top with fig slices, a drizzle of yoghurt and some rocket leaves.